Holocaust survivor, Winnipeg businessman and philanthropist Arnold Frieman has died. 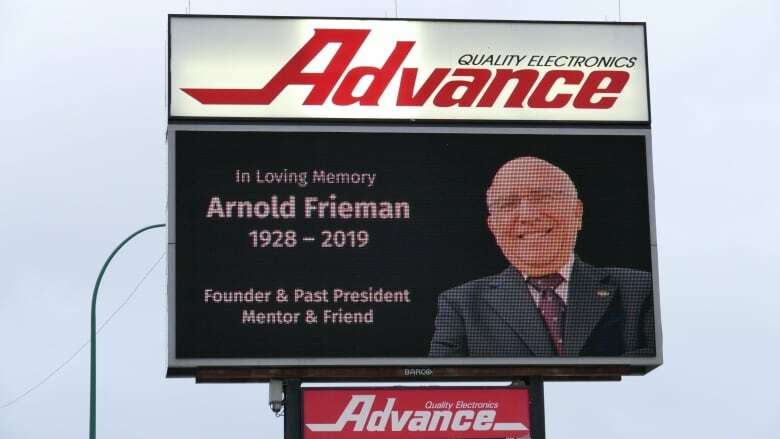 Frieman, who was born in 1928 in Hungary, was the founder and former longtime president of Advance Electronics. "As a teenager alone, I lived through hell on earth," he said in 2018, but he survived and found love, community and personal success after he came to Winnipeg in 1951. He received numerous awards and accolades in his lifetime, including the Order of Manitoba in 2006 for his "steadfast commitment to the Manitoba community," and an honorary doctorate from his alma mater, the University of Manitoba, in 2018. He also volunteered and donated to numerous organizations, including the U of M, the Winnipeg Symphony Orchestra, the Manitoba Conservatory of Music, the Royal Winnipeg Ballet, the Jewish Community Council and Joseph Wolinsky Collegiate. Frieman was 16 years old and studying in Budapest when he heard that Hungarian Jews outside of Budapest were being rounded up and shipped out of the country, he said in his address when he received his honorary doctorate. "I headed back home, trying to save my family, but heard they were deported to a place I later found out was the gas chambers of Auschwitz," he said. He was captured and placed in a forced labour camp. "In the camp there was an ever-present threat of impending death," Frieman told CBC Manitoba in 2011. "You felt your life was worth less than, I don't know, a dog's, and the hopelessness and the evil that came from your supervisors, and every day there were less of us, less and less, and the writing was on the wall." However, he made what he called a "miraculous escape," and after the war he was taken to Norway, where he studied electronics. He used that education when he became a pilot for the Israeli air force, taking part in the 1948 Arab-Israeli War. In Israel, he found out that two of his sisters had survived the Holocaust and was reunited with them. He decided to immigrate to Canada: "I arrived in Winnipeg in 1951 with nothing but the clothes on my back." In Winnipeg, he found a job and friends, including Jewish philanthropist Minnie Heft, who encouraged him to go to university and gave him $1,000 to help pay for his education. He started a business fixing and selling car radios he bought from wrecking yards to fund his studies, and graduated with a bachelor of arts degree in 1960. He met Myra Thompson at university and married her later the same year. In 1961, he bought Advance Electronics, then a small business with two employees at Langside Street and Portage Avenue. A year later he moved it to Sargent Avenue, then to its present Portage Avenue location in 1966. "Advance's business philosophy is, quite simply, look after the customer and everything else will fall into place," Frieman is quoted saying on the business's website. Advance Electronics became a staple of the Winnipeg business scene, with television ads in the 1980s and 1990s encouraging people to "Dance with Advance," among other slogans. His funeral is Monday at 10:30 a.m. at the Shaarey Zedek Synagogue, an online listing says.